Actin beta antibody recognizes cytoplasmic actin beta, also known as beta-actin or cytoplasmic 1. The antibody has been extensively validated for western blotting using whole cell lysates. Mouse anti Human actin beta antibody recognizes cytoplasmic actin beta, a 375 amino acid cytoskeletal protein known also as ACTB and beta actin. Actins are highly conserved proteins that are involved in cell motility, structure and integrity and are ubiquitously expressed in all eukaryotic cells. Six different isoforms of actin have been identified in mammals (Vandekerckhove et al. 1978). Mouse anti Human actin beta antibody is highly specific for cytoplasmic actin beta and does not react with other actin isoforms. 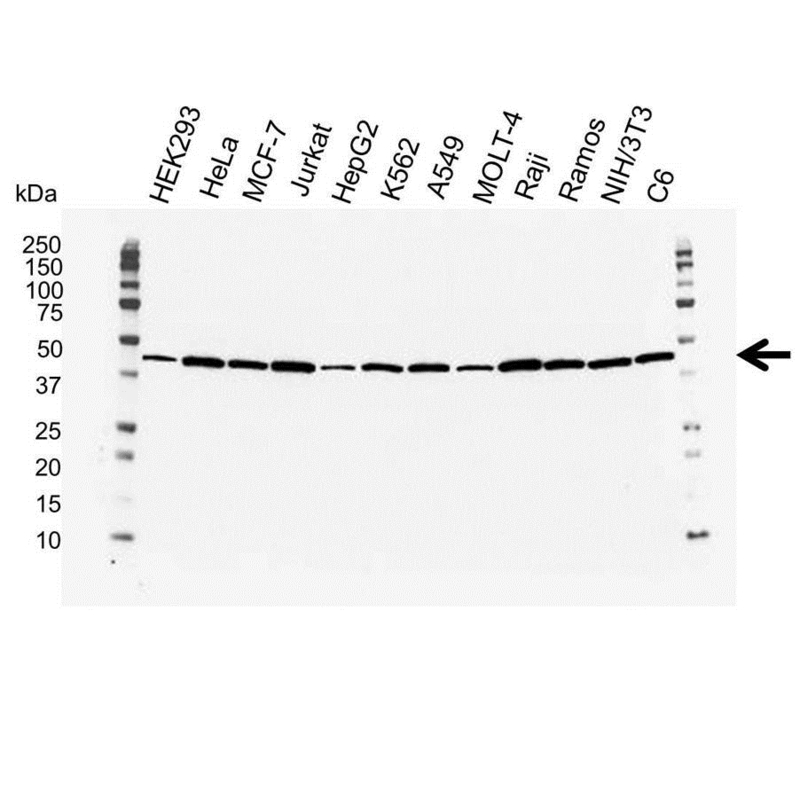 Mouse anti Human actin beta antibody recognizes actin beta as a single band of ~42 kDa in a wide range of cell line lysates by western blotting under reducing conditions. Anti beta actin antibody detects a band of approximately 42 kDa in HeLa cell lysates.